Sustainability goals on the farm extend into every realm of operation. As a result, sustainable wood finishes for the beehives were researched. While not vital due to only the outsides of the hive requiring paint while none reaches the living quarters, I still hoped to avoid using chemicals on the colony’s permanent home. Linseed oil was one of the most promising products but various accounts of attempting to finish exterior wood surfaces with the substance were exclusively negative. Most reports stated that the oil never dried so every time the finished surfaces are touched, they leave an oily residue turning rancid over time. Others stated it just flat out did not work for protecting the wood without bi-annual reapplications. I’d rather not have to paint the home of an active bee colony twice a year. Unfortunately all other concoctions seemed to be equally worthless for exterior use. There were some promising sounding products but they were prohibitively expense at $50 and up per gallon. As I have no desire to test any of the …interesting… sounding homemade concoctions, I gave up on my search and settled for exterior latex paint. Returns and botched mix jobs came to the rescue! Every time I am in a large superstore like Walmart or any home improvement store, I look for marked down paints. 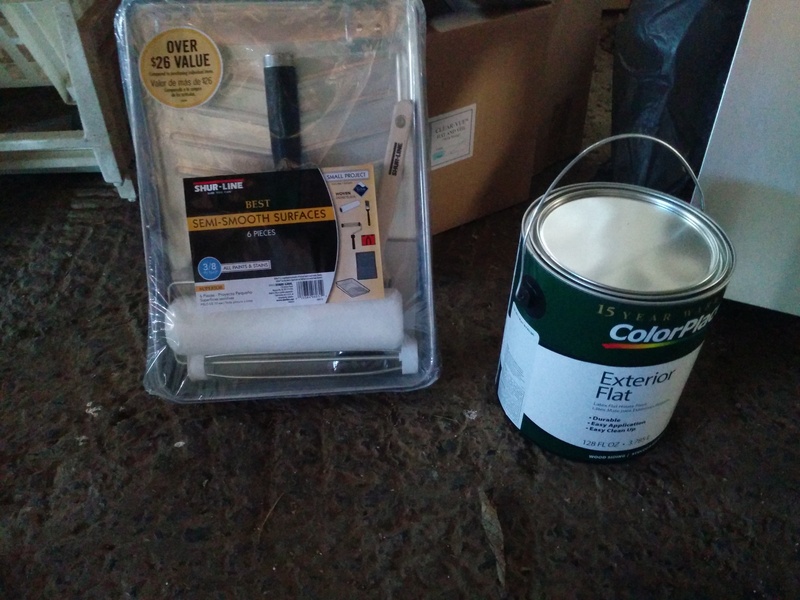 Spring is the prime time for housing projects so be alert and stock up if you need any paint! Most of my paint is required for wood that will be in contact with the ground but will be hidden behind a wall, buried under animal bedding or some other sort of visual barrier. My last gallon of exterior paint came from Lowe’s and was $2.50. Ugly is an understatement for the color as it is the worst I have ever witnessed but the chicks inside of the brooder will be the only ones who see any trace of it. For the beehives I found a gallon of exterior white paint marked down to $10 at Walmart. Color is not important but most keepers I have experienced in my classes suggest a light color yet have zero justification as to why even when pressed. I think it is one of those things no one cares enough to question so on perpetuates the preference of a teacher generations ago. That holds true for me as well. I also picked up a 6 piece painting kit on sale for $7. I absolutely loathe painting as I usually spend 75% of the time prepping and 25% doing the actual painting. 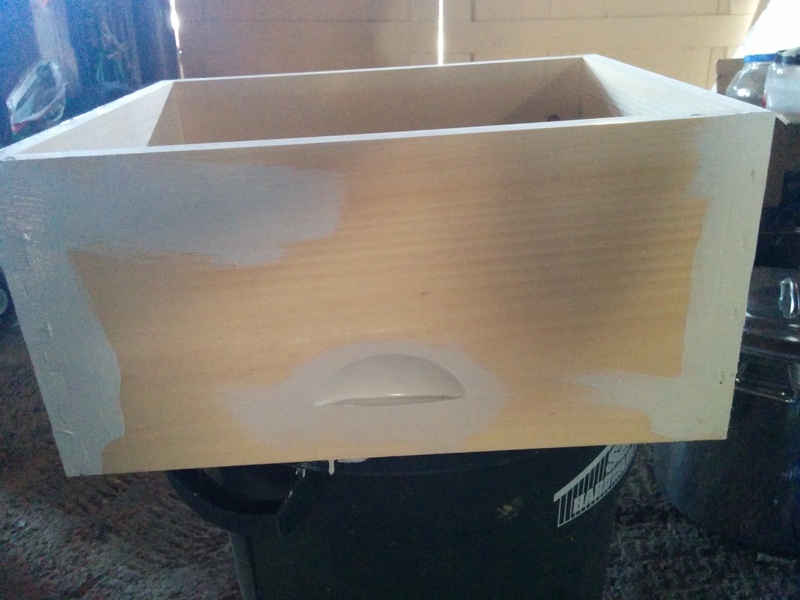 I forgot my roll of tape to protect tops, bottoms and any other surface where paint in unwanted. However I did not want to waste the day of work and 1 hour round trip to town so I dove in anyway. Paint ONLY the outside surfaces of beehives. Bees will seal the inside of their home up with propolis anyway (a resin product they make from tree saps that seals and insulates their colony). Tape the metal of telescoping tops, or wipe them with some sort of rag and paint remover the next day. Latex doesn’t bond well to the metal so it is easy to clean off after it dries. Paint the hive components upside down. That way the flat surfaces of the handholds are easy to see and paint. Tape the tops and bottoms of the supers or any hive components. Beehives just sit stacked on themselves with no support so I did not want to ruin the smooth wood surfaces with paint. Alternatively I kept cutting fresh rags from a discarded T shirt and continuously whipped the top and bottom surfaces as paint beaded onto them. Paint the rough ends of the supers first. Also hit the knots first as both tend to drink up paint. IMPORTANT: Do not stack the hive components while the paint dries. The nature of latex paint will glue them together then destroy the paint job when pulled apart after it dries. One coat of paint took me about 2.5 hours to apply to a complete hive. I put two coats on 2 hives so overall, it was 8-10 hours split over two days to allow the first coat to dry. Note: Complete hive for me is a bottom board, 2 large supers, 3 medium supers, inner cover, top feeder, telescoping top and the entrance reducers. 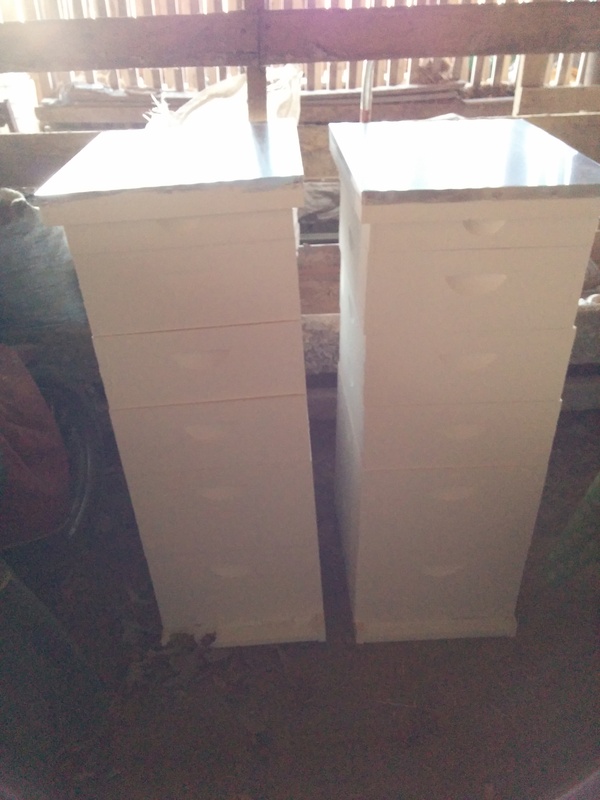 When buying hives you can get them unassembled, assembled, or assembled and painted. If I had to do it all over again, my choice would be situational. If it is a rush to get the hives ready in the busyness of building a farm in the spring, I would choose the assembled and painted. 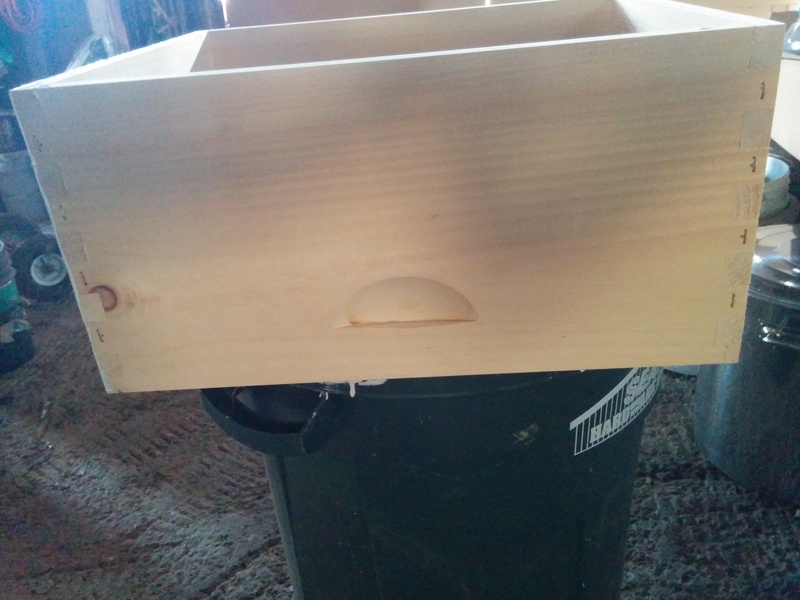 It is about $4/super extra but it would have saved me 2 days of painting assembled hive components where I could have been building fences, building water troughs, building garden beds, installing rain catchment systems or planting stuff. 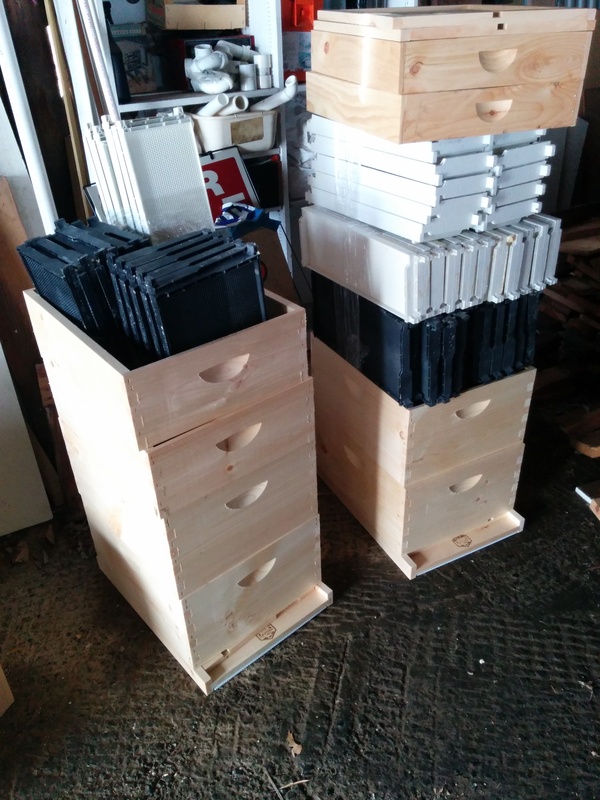 Here are the hives I bought, assembled but not painted. If I had time to plan ahead and work leisurely, I would opt for the unassembled where I would have to glue everything together and paint it myself. I sense I am rambling now but I wanted to give you a true look at the work involved and what time-investment is required by various options as well as some tips to knocking it out easily. Let me know if you have tried any wood finishing methods for exterior surfaces that are more natural or sustainable than paint. I would love to learn about them!